devour one of its own for a few additional box-office dollars. Hitchcock, after all, died decades ago and is in little position to speak for himself. If I may be so bold as to make a prediction, at some point down the line some movie-brat filmmakers will also want to over-dramatize the life of Italian legend Federico Fellini, another world-class maestro of the picture shows who made no secret of some of his private obsessions and preoccupations (and who hired voluptuous actresses, thus providing job opportunities for many of today's voluptuous actresses; gotta be historically accurate, right?). Never mind that Fellini had what I assume - of course I'm probably a naïve idiot - to be a basically long and happy marriage to actress Guilietta Masina, and scandal-free, mafia-untainted professional and personal collaborations. By the time the 21st-century artists du cinema get through revisioning him, Fellini will make Dario Argento look like Disney (who was also a demonic fiend, I'm sure we'll learn. Daniel Day Lewis in his GANGS OF NEW YORK getup, perfect for Walt). Meanwhile, for a look into the mind of Fellini the way Fellini might have actually wanted it, there are his own movies, especially the ones in which Fellini got away from the Italian neo-realist style of filmmaking in which he started out (but never really declared any allegiance) and let his anything-goes imagination take flight. 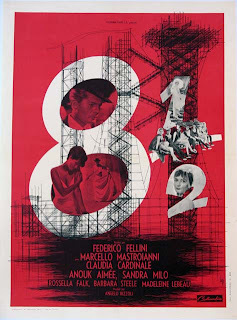 Foremost among them: 8 1/2, an art-movie so `arty' that for a while it pretty much became a password for a sort of WTF? variety of art film. If I'm not mistaken, even The Partridge Family made fun of it once. Don't get me started on the stage-film-musical remake NINE. The densely-personal masterwork is so named because the great filmmaker reckoned that - factoring in his short subjects - he had completed seven-and-a-half features before making this one. Marcello Mastroianni portrays Guido Anselmi, a trendy superstar Italian film director, not unlike Fellini himself (though, I guess you could say, a mite better looking. That's why it's good to be the director-writer). Guido is seen idling away at a luxury spa before beginning the shooting of another hugely anticipated film. Except that Guido either can't or won't get his game on, as the saying goes these days. The Fellini stand-in is hounded by fans, parasites, his clinging mistress, his nagging wife and the media. While money-men producers, wannabe actresses and entourage swarm around, a giant rocket gantry set goes up for what appears to be a sci-fi epic. But Guido himself has no idea what his proposed movie is about - a metaphor for being stalled on the launching pad, get it?. Instead he makes excuses and lapses into wistful reveries about his past and fantasies about his present, mainly a mix of Catholic guilt and lust over women in his life, from mama mia onwards to lovelies who just can't wait to tear him down. The plot-about-nothing-before-anyone-ever-heard-of-Seinfeld builds to a famous and beautifully choreographed fantasy sequence in which Guido literally becomes a lion-tamer in a cage, keeping a menagerie of snarling, enticing and generally predatory females in his life at bay with his bellowed defiance and a bullwhip. Maybe that kind of thing is what goes on inside of Silvio Berlusconi's head all the time, and we should be more sympathetic. You internet kids reading this, you have no idea who Silvio Berlusconi is, do you? Yet you'll always get hired over me in a news gig. Especially you girls. Maybe over the long haul Guido's distraction carries over the viewer. All I can say is I watched 8 1/2 a couple of times and, until the last, [SPOILER ALERT] somehow completely missed a key detail at the end, when Guido, undergoing a very public breakdown, gets hold of a handgun. Does the character actually commit suicide? Or is that just a metaphor, and the artist-hero has just written his own story to end this frustrating chapter that way, and then move on? Or - in a theme continual throughout Fellini's career - is life itself just a sort of self-centric movie/pageant, privately invented and personally staged for every individual's interior pleasure? Something close to this last is what many of America's school shooters and gun-nut maniacs seem to believe when they open fire, I mean, uh, exercise their Second Amendment Rights in pursuit of happiness and personal fulfillment; good thing you'll no sooner catch that type of viewer at a screening of 8 1/2 than at a vigil for the slain in Newtown, Connecticut. Once you step outside into the streets of University Circle, though, you're on your own.